One of the issues we faced when developing the .NET SDK for Auth0 was that user profiles can have different properties based on the origin of the user profile. 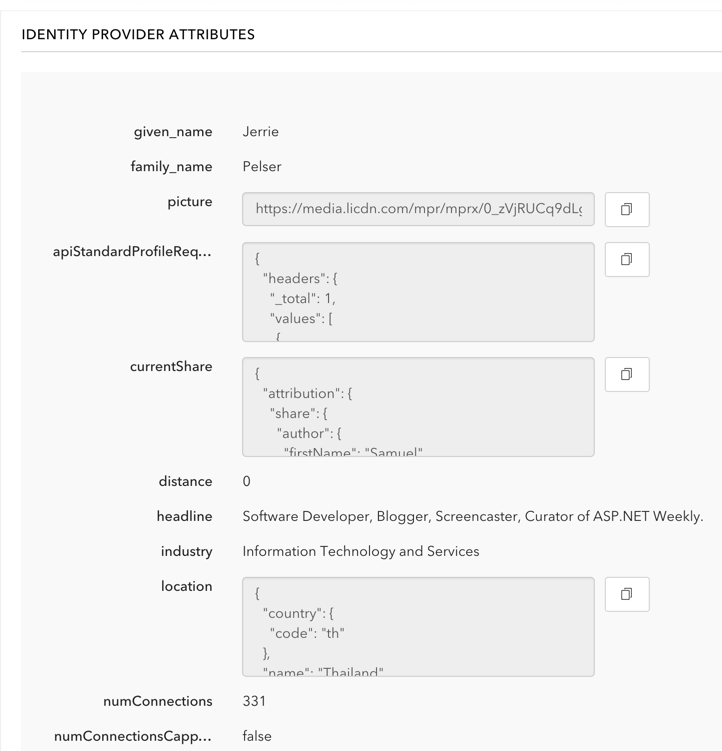 There are a set of standard properties for a user profile, but over and above that many of the providers can “enhance” the user profile with extra properties. The LinkedIn image is cropped and does not display nearly all the available fields in the screenshot. There are just too many of them. But as you can see the LinkedIn user has a bunch of extra properties which were populated that are unique to LinkedIn and which will most probably not ever be present in profiles from other providers. This also surfaces when retrieving the user profile through the Management API. Once again in the case of the LinkedIn document, I have removed a lot of the information returned from the API for brevity. But you get the idea that the API returns vastly different information depending on the original source of the user profile. The second option was to return a specialized User class for each user profile, depending on the original source. So for a user from LinkedIn we could for example return a LinkedInUser object which had all the extra properties for LinkedIn profiles. The last option was to simply add every possible property to the User class. The last option was quickly discounted, and after some deliberation we decided that the second option was also potentially too much work, as it meant that every time the core API team added an extra provider or decided to retrieved extra attributes from a specific provider, that we had to update the SDK as well. So finally we settled on the first option, but we were still not sure how to do this. The standard properties for the User class is FirstName, LastName, Initials and ProfileImage. These are common across all our user objects. Now when we deserialize the JSON array, all the extra attributes for the JSON documents which are not mapped to properties in the class will be added to the AdditionalData dictionary. JSON.NET is very easy to use to handle the most common cases, but what makes it so powerful is that it also has a few really advanced features which allows you to control how data gets serialized and deserialized, so you can almost always find a way to work around those tricky edge cases.